1. Place the whole orange and apricots in a pan and cover with cold water. Bring to the boil and simmer very gently for 1 hour until very soft, then drain. Cut the orange in half and remove any pips, then blitz in a blender with the apricots. Leave to cool. the eggs one at a time. Fold in the polenta, baking powder and ground pistachio kernels, then the puréed orange and apricot mixture to give a soft batter. 3. Spoon into the prepared cake tin and level the surface. 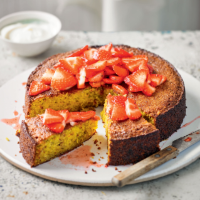 Bake for 50–60 minutes until a skewer inserted in the centre of the cake emerges clean. Cool in the tin on a wire rack. 4. Place the strawberries in a bowl and scatter with 2 tbsp sugar and the black pepper. Leave to stand to allow the juices to run. Spoon onto the cake, and serve in slices with spoonfuls of crème fraîche.